The Bertolino family comes from Castelnuovo Calcea, in the Asti district, where, more than a century ago, the family was already involved in winemaking and wine trade. In the 20s, the family moved to the neighbouring community of Nizza Monferrato. The first Bertolino license to sell wine is dated Nizza Monferrato, June 18th 1927! When Agostino, Giovanni’s son, was 17th he was involved in family wine company. It became the “Bertolino Giovanni & Son”. The Bertolino’s are famous for freisa, moscato and above all barbera, and their wines were awarded several prize and acknowledgements. Today, the company is runned by the three brothers Dino, Diana, and Gianni. Strong rooting in the land and history of their family are clearly reflected in the labels of Bertolino’s wines. To make good wine and to hand down from father to son the ancient and noble art of viticulture: that’s what Brothers’ Bertolino are keep on doing from more than a century. Today Davide Barbero selects and distributes two of their best meditations wines to accompany nougat, chocolate, tea biscuits and other sweet bakery products. Moscato d’Asti Docg “Été“: The Moscato d’Asti of Brothers’ Bertolino born from a selection of September grapes as lively and fresh as summer spirit. It has a characteristic straw colour. 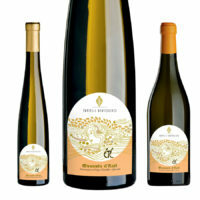 Its intense bouquet is aromatic and shows golden apple, pineapple and honey aromas. To the palate it is fresh and fragrant, as sweetness and acidity are properly balanced. The carbon dioxide fine development makes it slightly creamy, with an elegant and persistent close. Vinification: after being left with skins for a few hours at low temperature, the most is separated. After clarification and a first filtering, the most is left to macerate at low temperature in small stainless steel autoclaves. During fermentation foam is removed. To stop fermentation, the most is cooled and before bottling it undergoes micro filtering again. Bottling is carried out in November, two months after harvest. Moscato Passito Doc “Hiver”: The Passito of Brothers’ Bertolino born from a selection of ripe grapes almost harvested in winter period. It has a dark straw colour with amber reflections that immediately reveals wine consistency. It is typified by a fine and intense nose with enticing scent. The bouquet offers a sequence of dried fruit aromas that reminds of fig, apricot and orange peel with sweet notes of icing sugar and honey. Extremely persistent to the palate, it is not sickly-sweet, as the strong sugary residual is properly balanced with acidity. Vinification: Muscat grapes are harvested at the end of September, late in autumn when grapes are over ripened and begin to wither on the plant. Once harvested, grapes are put on straw mats to dry in the Estate farmhouse. Immediately after pressing, the most is poured into oak barriques for fermentation.